My creation for today is featuring the watercolor wash technique. A few drops of re-inker & water in a cup.....*paint* your watercolor paper; let dry and stamp---eazy peezy!!! I also decided to use more colors I rarely reach for....Sage Shadow is severely neglected in my home although it seems to go with Chocolate Chip very well!! I spiced up the background a bit with my fave texture plate, sponged around the edges of my stamped piece & decided at the last minute to add micro beads to the center of my flowers. The Soft Summer set from the mini is fast becoming my fave set but looking at it; it just needed that little something more. I added the micro beads & colored them with my SU! markers....I really like the final result!! On a seriously happy note, I won last week's Twisted Thursday challenge! I never win anything so I was so excited to get that email from Karolyn. I'm looking forward to this week's sketch....hopefully you'll all play along too!! Now I need to get things ready for tonight's class....thanks so much for stopping by and have a great rest of the day!! This is gorgeous!!! Wowwy, time to use sage a little more often!! Love this color combo and your technique is perfect!! Love it! Jackie... beautiful card! Congrats on winning the Twisted Thursday challenge (you shouldn't be surprised!). oh wow, its beautiful, I love it so much. O.K. I seriously had to put my Brown Free glasses on for this one, but I really love those colors together!! The images and the layout are so pretty. You can seriously rock the flower stamps my friend!!! This is a beautiful card! 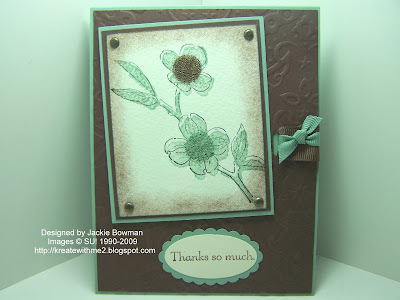 I have only used Sage Shadow card stock a few times so it is a much neglected color in my stamp space as well! I love the combo you used, and the inspiration you gave me to use it as well. Thank you and TYFS! Beautiful, Jackie!! Love this technique, and the colors!! I rarely reach for sage shadow either...thanks for the inspiration! Woohoo! Congrats on the win! :D Love the microbeads on your flowers! That green is gorgeous with the brown and your card is fabulous! P.S. Congrats on your win. Jackie, this is SO pretty! Even though you used brown, it's so soft looking...just beautiful!!! Thanks for the inspiration, Jackie....I forget about Sage Shadow, too, and it looks fabo with Chocolate Chip!!! Such a pretty card!!! Very pretty. I need to do challenges more often. Hey Jackie! Love the card and congrats on winning the challenge. I may have to try this one out - great job yet again! Jackie!!! I love this card!!! It is so elegant!!! How stunning Jackie!! Your card turned out gorgeous!! I sure do like those flowers!! :) TFS! Beautiful technique and end result!!! It is gorgeous Jackie!! Such pretty colors! Love the image! Ohhh Jackie, I love this. I didn't order this set yet, you made me want it. Beautiful! I must remember this technique, now that I have some re-inkers!